﻿Published by Sareth Ney on Oct. 19, 2016 at 8:51 p.m.
ORLANDO, Fla. – Orlando Indie Comedy Fest extended the deadline for consideration and the final date will be Oct. 23. Stand-up comics will be selected to perform and those chosen will be announced on Nov.1. The festival takes place from Jan. 19 through Jan. 22. Comedians selected for the Orlando Indie Comedy Fest will perform three sets, over a span the four nights. As the dates approach—they will all perform extra sets, at additional locations and events. For the initial three sets—they will perform an early, middle and late performance. Each will be between eight and 10 minutes in length. Headliners and openers will perform an extended set. Number of performers chosen for Orlando Indie Comedy Fest will be between 25 to 30 national comics. About 20 Orlando and regional comedians will be selected. The entry for consideration to take part is $35. Locals are exempt. The cost of submission will help cover the cost of lodging, at least one meal a day, transportation to establishments and events. Headlining acts will be compensated and will be announced, as the dates approach. 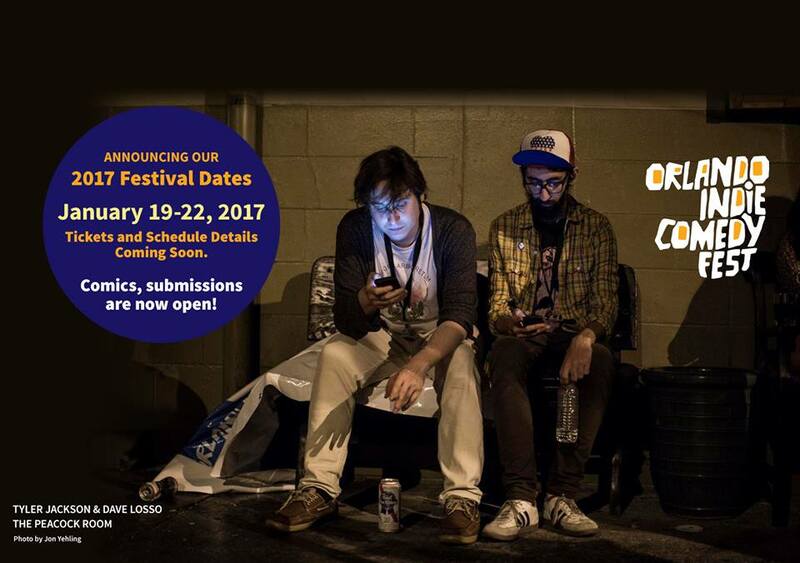 Submission forms for the Orlando Indie Comedy Fest require the following: full name, email address and cellular phone number. Address, city, ZIP code, Twitter handle, Facebook URL, video submission URL and a biography are optional. Several check boxes are located near the bottom of the submission form on where comics learned about the festivities. Options include from another comic, through social media, a website and/or applied at a previous festival. After the application for consideration is submitted to the Orlando Indie Comedy Fest, non-local comedians will be directed to pay the submission fee. Payments being accepted are Mastercard, Visa, American Express, a bank account, PayPal and PayPal Credit. Volunteers operate the Orlando Indie Comedy Fest. Their participation supports mental illness counseling and the comedy scene in Orlando. Helpers can help in a variety of ways including: recruiting festival sponsors, guide those attending to where they need to be, be part of the street team (i.e. handing out fliers, displaying posters and distributing other promotional content), transport comedians and volunteers to venues, aid in technical and online support and host and/or feed comedians. To fill out the form to become a volunteer, click here. Levels of sponsorships available are day, headliner and coaster. For more information in regards to becoming a sponsor, volunteer, mission and charity—please email info@orlandoindiecomedy.com.